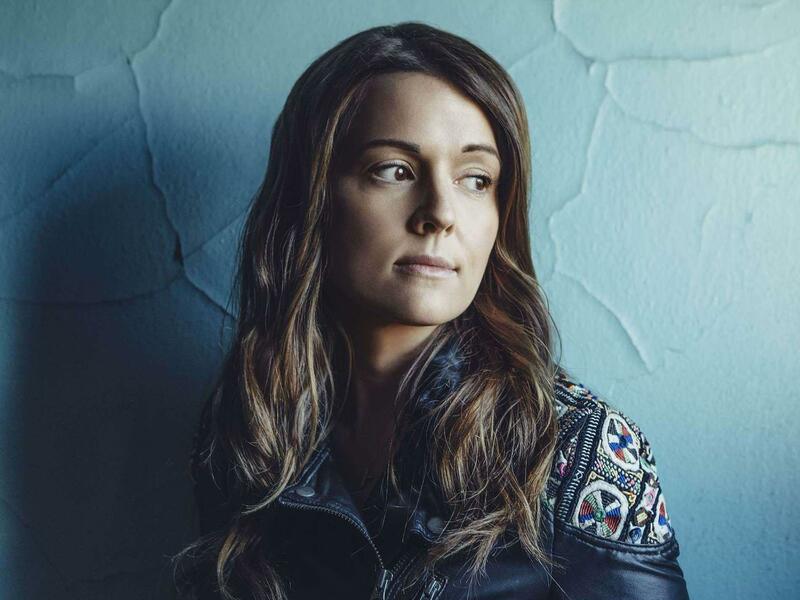 Brandi Carlile's fifth studio album, The Firewatcher's Daughter, will be out on March 3. It's been common for a few years now to dismiss rock and roll as a shadow of its former self. Usurped by dance beats and hip-hop samples, lost amid the pop spectacle that dominates the Distraction Age, music centered around electric guitars and liberated voices can now seem staid. But maybe we need a new definition of rock and roll; maybe we should return to the original one. In the mid-1950s, when Chuck Berry, Elvis Presley, Buddy Holly and Little Richard were inventing the practice, to rock was to make a genre-defying leap that connected country to R&B to teenage Top-40 music. Most of all, rocking meant being willing to chance a little rawness. Brandi Carlile, whose upcoming album is as rock and roll as a singer-songwriter's effort gets, defined the term beautifully in a recent email exchange with me. "There's this indescribable point in rock music where a song becomes known just enough to play it all the way through without falling off the horse, but not enough for an artist to have any control over it," she explained. "That is what I think rock and roll is ... and it's scary." There are many such moments on The Firewatcher's Daughter, which will be released March 3 on ATO Records. Some of them rattle the floorboards; others are quieter, offering beautiful harmonies or rich storytelling. But no matter what they sound like, the songs on this release feel like rock and roll. According to Carlile, this is because of the way they were recorded. For this first album on the independent ATO after three for Sony subsidiary Columbia, Carlile and the Twins (as she and everyone calls her partners in songwriting and performance, Tim and Phil Hanseroth) went straight into the studio with new material. The atmosphere was intensified by recent milestones the band had crossed, including the pregnancy of Carlile's wife, Catherine Shepherd. With emotions running high and the reins off their process, the band was able to hone in on every great aspect of Carlile's music — its emotional openness, beautiful melodicism and rich textures that reflect a deep engagement with many different corners of American music. The song we're featuring here, "The Eye," is exactly what it proclaims itself to be: a quiet breath in the midst of the album's glorious storm. Rooted in Carlile's love of both classic country and California pop (particularly Fleetwood Mac), the song is the kind many other artists are going to want to cover. It will be hard to top the original, though; it so eloquently highlights the telepathic connection Carlile shares with her longtime bandmates (on display in a video of the trio singing the song at the bottom of this page). A favorite on recent tours, "The Eye" is destined to become a centerpiece in Carlile's catalog. Over email, Carlile discussed the making of The Firewatcher's Daughter, the near-supernatural connection she has with the twins, and why being a married parent is as rock and roll as it gets in 2014. The first thing I thought when I heard the new album was, wow, Brandi and the Twins are rocking! I know you took a different approach in the studio this time. How did that come about? Thanks! We took SO many different approaches in the studio and the lead-up to it. I'd say the biggest shift that resulted in us really rocking had to do with the fact that we didn't make any demos. To me rock and roll isn't really a genre but more of recklessness or a risk. ... The more something gets ironed out and sure of itself, the less it begins to rock somehow. I don't know what that makes it, but definitely not authentically rock and roll. Being on Sony for all those years was amazing for so many reasons, but one of the few bitter pills we had to swallow was the way we had to "demo" our songs and get them past the powers that be, just to prove they'd make a good record. ... I'd end up with all of these demos and I could hear the moment on them and never get it back again. I adore all of our records we've made, but damn it, you should hear those demos. The album ranges widely, soundwise, from the country harmonies of "The Eye" to power pop to that Roy Orbison-style heartthrob thing you do, which I love so much. Did you enter the process of writing these songs with the goal of showing your whole range? Other albums have focused on one or the other of your approaches. Thank you for noticing that stuff! I got some baby clothes from the Orbison Estate that said "pretty woman" with tiny Ray-Bans. ... I died from excitement because you know how much I love him. Our whole range is so eccentric because of the close "cultishness" of the twins and me, and the fact that the three of us are so different. Having three equal writers for a band is tricky, and not just for sequencing. I'm always trying to pull all the songs together with something, whether it's a drum or a theme or some ambient sound they all have in them, subliminally. I didn't even try to rein it in this time. We totally let go and embraced how different our songwriting is. My wife was nine months pregnant, so there was very little I could control except my dog! All that vulnerability is all over this record. Family — finding it, keeping it — is a big theme on The Firewatcher's Daughter. I know you started your own family this year, and so did the twins. It's a corny question, but it seems applicable here: How did becoming a parent influence this particular creative work? Phil's daughter, my niece, is 2. She was in the studio shirtless with a drumstick and her war paint quite often, cheering us on. Tim's son, my nephew, is 1; he was there when he was first learning to laugh, which is so inspiring it's beyond explanation. Believe me, there was a level of intensity and humanness in the studio that the twins and I were not used to. Call it hormones or jitters or whatever, but there were tears and fights and total celebration in that month, and we were all together all of the time. It was crazy, and I think you can hear it. As far as parenthood goes, it's not a corny question at all because it's right there all the time. It's like the elephant in the room for a rock and roll band, because you're lying if you say you don't lie in bed and wonder if you're cool now that you have songs from Nickelodeon stuck in your head and love your wife and kids. But rock and roll is the people's music. It's supposed to represent all of free-thinking society, and a lot of people have kids, so it is cool to me. I know that getting paid as a musician is more difficult than ever before because of changes in the way recorded music is distributed. Yet I've also noticed that many of my favorite artists, who are in midcareer, are making the best and most assertive music of their lives. You, for example — this album really feels insistently personal and bold, from the song styles to the production to your singing. How has the changing reality of being a working musician influenced your creative process? I'm seeing some of the same trend. On a large spectrum. There could be a touch of "nothing to lose" in the air. For me at the time, insistently personal was all I had. I'd been off the road for over a year and had just gotten married and dove into trying to start a family after manically touring my 20s away. Being a working musician was all I knew how to be. It took that time off for me to forget how to be an entertainer and an artist on a major label chasing that dragon, to remember what it was like to write a truly innocent song again. You've said that "The Eye" is the song that's most representative of your band, because you all share the lead vocal. That's a powerful statement from someone who records under her own name as a "solo artist." Can you talk about the twins as collaborators, and specifically their role in making this song? When I met the twins I instantly loved them. I had to have them in my life; it was borderline obsessive! They had day jobs and were in a couple of other bands — it was all I could do to get them to want to play with me, let alone be in a band with me. I had six residencies a week, so almost every night I was in a different bar or restaurant, and during the day while they were working I was pinning fliers or busking at [Seattle's] Pike Place Market. The twins would play with me at lots of these gigs, and the idea of three-part harmony at that time wasn't really very cool, but it was somehow solidifying what we would eventually commit to and pursue. But all the gigs were already billed as "Brandi Carlile," and believe me, they didn't want those gigs stuck to them. We just kind of went with that name and never changed it, but at the time, if I thought I could get them to stay with me by calling our band "The Hanseroth Brothers and that bar singer" — that would be our name. "The Eye" used to be two separate songs. One of the ways we write is just to walk around near each other playing our songs and passively wait for the other two to say, "What's that, you should go to that minor chord earlier," or something. Tim had been playing these two songs that you could really tell were beginning to take shape into something special. Phil and me just suggested that he combine them, and I added a last verse. ... When they took shape we just decided to go for it and make this our one song where we sing evenly all the way through. I love the catchphrase of this song — "You can dance in a hurricane, but only if you're standing in the eye." It's a proverb! Did it come to you in a flash? It came to Tim in a flash. I will forever be jealous of the way that man is with words. Some of my favorite things ever said were said by him: "For a heart that is broken makes a beautiful sound."